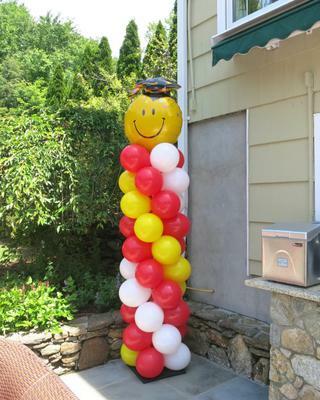 During graduation season I get lots of requests for columns outdoors in the sun. I try to avoid dark colors and under inflate the balloons to keep them from popping. Can I use PVC instead of aluminum for the column poles? Your submission came in a bit garbled, so I am not sure if I got your question right. It's a good idea to avoid dark colors and under inflate balloons for outdoor decorations. I have a few more tips on my page about 4th of July decorations. I don't see any reason why you couldn't use PVC for your column poles instead of aluminum. The important thing is that the poles and base are heavy enough so that the balloon columns stays stable under outdoor conditions.